If you would have something in Japanese you want translated into English - whether it is a few sentences, a whole article, or even a video, help is at hand! I am pleased to announce the commencement of our Japanese-to-English Translation Service! I decided to offer this service to combat the frustration situation of those who have a new magazine interview or a fascinating video in Japanese, and are dying to have an English version. It's easy to arrange a translation - just drop me an email. 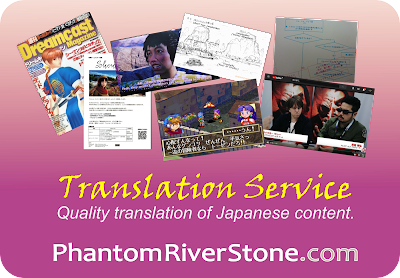 Translation will be carried out by yours truly (Switch), and will be treated with the same high level of care as for the items I translate for the Phantom River Stone blog. My qualifications: I hold Level One (top level) of the Japanese Language Proficiency Test, and have been living in Japan for several years. Over the years I have worked on a great many translations for the blog and fan projects. Present-day & historic magazine articles and written interviews e.g. Video subtitles, such as the 1999 NHK "Making Of Shenmue" documentary and the Shenmue III Presentation in China (2015). Game design documents e.g. Concept Sketch "Wharf Near Langhuishan"
The content for translation can be about anything - it does not need to be Shenmue-related, or even about video gaming. The level of translation is also flexible: you may like to initially commission a high-level outline to get the gist of the content, before deciding whether to continue with a thorough translation. Translation fee: by mutual agreement beforehand. To arrange for a translation, contact Switch via email now!